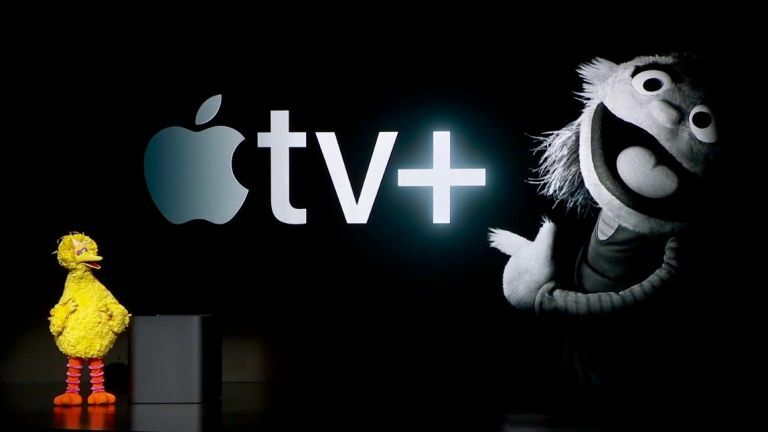 So, Apple TV, Apple TV+, Apple Arcade, Apple News+ and Apple Card just launched, helped by Big Bird, Oprah, Captain America, a man in a jumpsuit and a cast of thousands. It was emotional… But you already know that as it is in the headline. That was the Apple Event to end all Apple Events despite the lack of any products whatsoever. It was all about services, you see. Note: this was a live blog that we've kicked into some kind of coherent order. Apple is making TV shows and movies. Apple TV+ is an on-demand, subscription service that will be available on Apple TV (the app) in 100 countries from autumn/ fall 2019. Not clear if it will be a free part of the Apple TV experience – see below. Numerous big names – both actors and creative people – are taking part in Apple's foray into content creation. To be fair, if you pay creative people, they will do what you ask them. I can vouch for that personally. Here to also vouch for that is Oprah Winfrey, slightly haltingly talking about mixing technology with humanity. If you scroll down you can read about Wyatt Mitchell and his challenging fashion, but Oprah has slain him here. She's come as a ghost disguised as Colonel Sanders. Gosh, that was borderline mad. Very passionate anyway. Apple TV+ will not so much show us some cool original movies and TV shows as reforge humanity in a more immaculate form. So that's nice. Apple is going for something a little more intangible or emotional than a mere product launch here. Steven Spielberg has spoken movingly and interestingly about the nature of creativity and now uh, Reese Witherspoon and Rachel from Friends Jennifer Anniston are talking about their Apple TV+ show The Morning Show about dysfunctional news people. Steve Carrell is also in it. We here in the UK do not require this as we have This Time With Alan Partridge. Jason Momoa is mansplaining blindness to his new Apple+ show co-star, Alfre Woodard. You can't just turn blindness off, apparently. Who knew? They are in an Apple+ post-apocalyptic serial that seems tantalisingly similar to Bird Box, on Netflix. Some of the Sesame Street team are doing a kids' show for Apple TV+ called Helpsters. Teaching pre-schoolers about coding. That might sound like a Black Mirror plot, but no. It will make them kinder. Which is German for children! Also on board: Bill Murray, Spike Lee. And, for the under 50s, Brie Larsen. The best superhero named after cheese, for my money. You know, all the Hollywood stars Apple are rolling out here are all very fine and well but they can't really match the high wattage charisma of Phil Schiller or Roger Rosner. Chris Evans (no, not that one; the one who plays Captain America) was LOVING this earlier, by the way. Apple TV (the app) will run on iPhone, Apple TV, iPad from May, via a software update and to the Mac in autumn or 'Fall' if you are American. The app will also land on selected TVs, starting with Samsung in spring, followed by Sony, LG and Vizio. Roku and Amazon will also be helping out. Apple has been providing TV online since the days of iPod. I do not remember that I must admit. Peter Stern has been handed the hospital pass of trying to sell an alternative to Netflix. The Apple TV app puts all your iTunes movies and TV alongside American broadcasters' content. There are also channels available on a pay-per-view basis, so you don't ned to subscribe to an entire, Sky-style satellite or cable package, all ad-free. So basically it's not a Netflix rival per se, it's an aggregator. More comparable to Amazon Prime Video. I thought this would be called Apple Movies & TV because Apple TV is already a thing, and it's a box. So that shows what I know. Apple TV will use human editors and algorithms based on your viewing habits and channel choices to push more cool content to you. The clever bit here is that multiple broadcasters and content providers are in one platform. Now, this is not at all a new idea, as anyone who's used BT TV or Amazon Prime Video, for a start, will know. Apple will be relying on the notion that it can make it more seamless, easier to search, and market it better. There's a safe, separate section for kids which, again, is hardly novel. I made some predictions/gave some advice to Apple on how Apple TV and Apple TV+ could rule the video streaming market. And some came true. 'A brand new slew of games that redefine games'. This is Apple's answer to Stadia. Remember that? Apple is emphasising working with gaming creatives to create emotional and visceral experiences rather than yakking on about streaming. There will be 100 totally exclusive Apple Arcade titles at launch, paid for by subscription, within the App Store, with games playable across all Apple devices, on and offline (once downloaded, obvs). No ads and no in-app purchases. Subscription will be along the same lines as Apple News+ (below) with a tonne of content, on demand, on a subscription basis, with the sub being usable by your whole family/household/harem/whatever. The idea is very cool, now let's see what the games are like. It'll be available in autumn or fall with pricing details to come. If you were trying to think of a name for a credit card made by Apple, what would you call it? Apple Card 'completely rethinks the credit card' by leveraging the power of iPhone. By which they mean, now your iPhone is your credit card whereas up to now, it's been a portal for your boring old card-based credit card. Issued with the help of Goldman Sachs, Apple Card has no annual fees and no late fees. A lot of whooping for that, this audience has obviously been stung by this before. A LOT. Apple Card will help you have a healthier financial life. How? By showing you exactly where you made each transaction via a Maps tie-up, and showing you break-downs of your spending. Here's a feature we can get behind: daily 2% cash-back rewards (and 3% if you're buying Apple stuff) called, aptly enough Daily Cash. Right there in your account, straight away. Well for the profligate this sounds potentially ruinous to me, and I speak as someone who recently bought a watch just so I could earn enough reward points on my Amex to get one free flight at some stage. Prudently, Apple Card will show users a range of payment options, not just minimum payments. Privacy and security are market leading as they're handled on device with fingerprint/face recognition security. This one only comes with 1% Daily Cash cashback. This is described in terms that will be familiar to anyone who's seen American Psycho. It's titanium. It's laser etched. The tasteful shade of white… my god [KILLS MAN WITH AXE WHILE TALKING ABOUT HUEY LEWIS & THE NEWS]. Let's talk about this, says Tim. You talk about it Tim, I need a whizz. 10 billion transactions on Apple Pay this year. Yeah yeah. This is the most minor announcement, then. The undercard in the Apple TV+ boxing title fight. Individual subscriptions to everything on Apple News Plus would cost $8000. Apple News+ costs $9.99 per month, with access available to your whole family under your subscription. Apple News+ really is a lot like Readly but slicker and with more Canadian titles. After North America, the UK is the next place Apple News Plus will launch. Take that, Europe! Recapping on what was just said: Apple News is the #1 news app, used by millions. Now Apple is bringing magazines to Apple News with Apple News+. Older readers may recall they did this before with iPad News Store. There are a load of journalists telling us how important they are. Well, we do great work! I'm explaining all this to you now, for instance. Roger Rosner is thrilled to tell us about this. Holy heck, what has Roger's pal Wyatt Mitchell come as? Wyatt has gone Full Jumpsuit. Viddy that, my brothers. He really does just need a bowler hat and a bit of the old ultraviolence for the full Clockwork Orange droog effect. News Plus will be the best news experience on a mobile device on all sorts of topics. Magazines for fashion – a topic dear to Wyatt's heart, I feel – travel, lifestyle… all the magazines. I'd imagine Readly are thinking, 'Hmm, this sounds kind of like us,' right now. T3 is the 2nd most-read UK title on Readly. Just saying. In summary: live (animated) covers, featured articles, great photography, easy navigation. Yes, this is iPad News Store 2.0. Newspapers such as LA Times and Wall Street Journal are on board too, as are online 'mags' such as Vulture and Skimm whatever that is. Interesting privacy fact: article recommendations are made on-device so Apple doesn't know you're reading Hello!, and advertisers can't track you. Tim Cook is on, after some intro music not unlike Pearl & Dean – older UK readers may recall that music. Duh-duh-duh-duh-duhhhhh-DUH! Tim is asking, "What is a service?" Today is all about services you see, as I correctly predicted yesterday, along with everyone else, everywhere. Please hold while we wait for Tim to get to the point and say, "And here's our Netflix rival." One thing I love about Tim Cook is he totally rails against that old cliché and stereotype about gay men always being really well dressed. Although he's looking better than he used to, today. Lots of monotone colours, to match his voice. Retro dance music from Phoenix on at the moment, France's 3rd best legacy dance music act, played by Billy Zane, on Apple Music. Apparently, Ewan McGregor is in the front row. Hopefully he'll be up later doing his dance from the end of Trainspotting 2. Apple's events are still always worth watching, even if it's only for the LOLs, but the 'It's Show Time' event on March 25 may be unusual. It'll take place, as is now customary, at the Steve Jobs 'Theater' (that's how Americans say Theatre) in Cupertino, California, and there will be some new Apple things that have already been widely leaked. The difference at the It's Showtime event is that those leaked Apple things won't be gadgets that you can hold in your hand. Instead, they will be services that you consume on the devices you already own. Foremost among these will be Apple's Netflix-rivalling TV and movie streaming service. You'll be able to watch this on devices such as Apple 4K. Or how about the new 2019 iPad Air and iPad Mini that Apple announced last week, or the new 2019 iMac that Apple announced last week? Oh and you can listen to it via the Airpods 2 that Apple also announced last week. That was a busy week. Apple's Netflix rival: will it be a wonder, woman? Apple 'invented' the tech event as we know it today. Or maybe it didn't, but Steve Jobs certainly did it better than anyone before, and had products, from iPods to iPhones to iPads, that really got people excited. The current Apple team lacks his slightly edgy, irritable charisma but nonetheless, whether there are any tangible products or not, they'll don their very best dad jeans to talk us through the Show Time event with much razzmatazz and relative slickness. However, as noted above, Apple has already seemingly dispensed with the devices we'd normally expect to see at this event. The iPad, iMac and Airpods have all been bundled out via press release, so they certainly won't be launching on Monday. The launch/announcement of a Netflix rival is a nailed-on certainty. There's also been much talk of a magazine subscription service to rival the likes of Readly. And there's also been some talk of, erm, an Apple credit card. An outlier that hasn't been much mooted, but is logical, is a new Apple TV – this could be an update to Apple TV 4K and/or a lower-cost, dongle type affair similar to a Roku or Amazon Fire TV Stick. There will surely be an update to Apple TVOS, even though that would usually be expected at Apple's WWDC (World Wide Developers' Conference) event in June. We don't know. But for starters, it won't be called Apple Show Time because there's already a cable station called Showtime. It won't be called iMovies because Apple doesn't name things like that any more. So we expect Apple's Netflix rival to follow the lead of Apple Music and be called something ultra-simple. It presumably can't be called Apple TV, as that's what they call their boxes, but it could be Apple Movies & TV. Or maybe they'll call it Sirivision. Who knows? There will surely be a free trial period at launch, and beyond, of up to 3 months. After that, we wouldn't be surprised to see different levels of subscription costs depending on what content you access, with a premium for getting at newer movies or more high-tone TV content such as HBO or major sporting events. The core offering could well be broadly similar to Netflix in terms of content on offer. In that case, it'll be priced the same as Netflix or slightly cheaper – Netflix is £9 to £11 depending on whether you want HD or 4K. However, if Apple goes more high-end, with more blockbusters and sought-after boxsets such as Game of Thrones, we'd expect pricing more in line with Now TV, or even higher. Now's Entertainment (TV) and Cinema passes cost £20 per month, but they're only at 720p resolution. However, we currently expect to see Apple Movies & TV running alongside Apple's existing iTunes Movies store. So you'll get a certain amount of content to stream and will have to pay extra to buy or rent blockbusters and the likes of Game of Thrones. It's the same approach that Amazon Prime Video takes. What will be on it? This is the billion dollar question. All the talk has been of negotiations with Starz, HBO and Showtime, with original content from Apple on top. It's possible, indeed, that this will be more of a streaming, multi-studio catch-up TV channel rather than a straight movies-and-TV Netflix rival. However, you'd think Apple would also want to include movies from all the studios that support Netflix and Amazon Prime Video (and more besides), rather than only having TV shows, documentaries and specials. Sports could also figure in a big way. It's said that Apple has set aside $1billion to produce its own content, with established names such as M Night Shyamalan, Oprah Winfrey and not-so-established names such as Damian Chazellae (director of La La Land) mentioned. Apple may be reduced to hailing its admittedly impressive, but already existing on Apple TV, Siri voice control and content searching or demonstrating that you can start watching a show on one device and then carry on, on another. At the moment, none of this sounds very exciting. Still, we are crossing our fingers that on Monday Apple will reveal genuinely thrilling original content, and third-party movie and TV packages, in 4K, at a price that is competitive with Netflix, Amazon Prime Video and Sky Now. Apple Movies & TV will of course be brought to you on iPhone, iPad, Apple TV, and the Safari browser on Macs and Windows PCs. However, over the next year we also expect to see it built in to TVs – Samsung, Sony and LG's 2019 televisions all feature support for existing Apple streaming services – and perhaps even appearing on devices from Roku, Amazon and maybe even Google. Although, okay, maybe not, as that is a bit of a Kim/Trump situation. Apple wants to be seen as a 'services' company as well as a devices one these days, and it can't do that by only providing services to iPhone and Mac owners. You can watch Netflix on just about any device short of your toaster. Apple must crave that same level of ubiquity. What will Apple's Netflix rival be like in the UK? This is more like a £12.50 question. Along with the other big movie and TV streaming services, Apple has repeatedly shown that it is really not that fussed about the UK's relatively small TV market. In the USA Apple TV, like Netflix, has far more quality content, interesting features, and things to do with baseball. It's entirely possible that this state of affairs will continue with Apple Movies and TV subscription streaming, especially at launch. Could Apple's TV service see the launch of a new Apple TV? There have been plenty of rumours about Apple launching a subscription service for newspapers and magazines. Think Spotify (or Apple Music) for the written word. There are already services like this, notably Readly – T3 magazine is the second most-read UK publication on Readly, as it happens. You pay a fairly nominal monthly sub (£8 in Readly's case) and get access to thousands of journals on your tablet or phone. Having been burned by the short-lived iPad magazine store and the Apple News aggregator, publishers may not exactly be battering down Apple's door to gain access to this but it should eventually chug along nicely. The financial press widely expects Apple to launch a credit card. Erm, okay. This could include Apple-related benefits such as cheaper Apple Movies & TV subscriptions. Or it might just be a credit card. It's hard to see what innovations Apple can bring to this. There's also the possibility of one or more new Apple TV boxes – no, there won't be an actual Apple Television, sorry. Remember, though that this is supposedly all about services, and the need to broaden Apple's reach beyond iOS and MacOS users. Apple TV 4K is also already an extremely able device that will easily be able to accommodate Apple's new service/s. Maybe Apple will launch an Apple TV 8K? No. No, it won't. There could be a cheaper, more dongle-like Apple TV announced, but we wouldn't lay short odds on that. Hey, where is Apple's Qi charging mat, anyway?